The Catholic Church has a new leader — an obscure African cardinal reputed to be a miracle-worker. But Pope John has his work cut out for him as he proposes sweeping changes in the Church. Who can he trust? And who is his deadly enemy? He makes plans to visit America, with his first stop in Boston. But Boston may be even more dangerous for him than the Vatican. 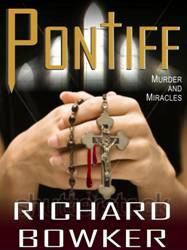 An assassin from the shadowy Protectors of the Unborn becomes convinced that killing the pope is the only way to stop rumored changes to the Church’s opposition to abortion. An incendiary Boston talk-show host incites opposition to the pope and his visit. And are there other, even more sinister threats awaiting the pope? In spite of opposition from their superiors, Father Joe Hurley and Lieutenant Kathleen Morelli of the Boston Police Department start investigating these threats. They find themselves irresistibly attracted to each other, even as they are pulled ever deeper into a web of intrigue that leaves them terrified for the pope’s safety. As the pope celebrates Mass at Boston’s legendary Fenway Park, Hurley and Morelli desperately try to stop the assassin who has the pontiff in his sights. Robert Coulter sat in the cold and the dark, waiting for the Devil to appear. Wet snow streaked the outside of the windshield; his breathing clouded the inside. His back ached; his fingers were numb. He knew he could turn on the engine and get some heat. But the heat would make him sleepy, and he couldn’t afford to lose his concentration for even an instant. The Devil would not appear for long, and he had to be ready. A car approached, and he slid down in his seat. The car slowed, then stopped, and he tensed. The driver’s door opened partway, and then a hand appeared and flung a newspaper onto a snow-covered lawn. The car sped up, and he watched it turn the corner and slow again as another newspaper landed on another lawn. The Devil read the paper. Coulter waited. He was so used to waiting by now—in dark hallways and freezing alleyways, hunched over and peering out windows or pacing anonymously along crowded city streets. He had gotten quite good at waiting. It was a kind of sacrifice, after all; you offered the boredom and discomfort up to God, and God sent you the grace and strength to endure even more. Today was not so bad, because he knew that today it was going to happen. There was excitement and anticipation instead of boredom. He had done his job, and now he was ready for the payoff. A light went on in the Devil’s house—just around the corner and across the street. He leaned forward, his heart pounding. Now? No, too soon. Around the corner was probably okay; across the street was too obvious. The Devil was crafty. If he spotted the car, he would know. Another light came on, this one downstairs. And then the front door opened, and the Devil appeared. It was impossible to see him clearly through the snow, but it was him all right, tall and thin and radiating evil like a foul smell. Wearing a shirt and tie, no coat. He hurried down the front steps and along the gravel walk, picked up the newspaper, and retreated inside the house. The Devil’s name was Arnold Beekman. Doctor Arnold Beekman. Soon now. Soon. Can’t get over-anxious, though. Coulter breathed deeply and visualized again how it would happen. It was Thursday. The plan would work because it was Thursday. He just needed to be patient. He stared at the house, waiting. It was an oversized white Colonial with black shutters; a two-car garage was attached to it by a short breezeway. Ornamental bushes were tastefully arranged on the lawn. The house was far grander than any place Coulter had ever lived. The Devil was well rewarded for his evil. He shivered, thinking of his mother wearily crushing cockroaches in their tiny kitchen, the sound of mice scurrying inside their bedroom walls, the battered furniture from Goodwill, the Christmas toys scrounged from a local charity. He thought of his father’s bellowing rage at the unfairness of his life. Why me, why me? Coulter shook his head and said a quick prayer. This wasn’t about envy. The Devil was the Devil, whether he lived in a mansion or a slum, just as babies were babies, whether they were inside or outside their mother’s womb. Coulter imagined Doctor Beekman sitting in his warm kitchen, sipping gourmet coffee and reading the newspaper. Enjoying the quiet, away from the screaming protesters. Thinking about the day to come, perhaps. The money he would make. The babies he would kill. But there would be the edge of fear, always the edge of fear, even in the quiet of his home. Because the Devil would know better than anyone that God’s will could not be mocked forever. Robert Coulter was the instrument of God’s will. Abortionists across America trembled when they heard his name. He was their scourge, their private nightmare. They could no longer sleep soundly in their mansions, knowing that he was out there somewhere, waiting. It was Thursday. Beekman would remember at last that it was Thursday. He puts down the paper, finishes his coffee, rinses the cup and leaves it in the sink. Looks around at his beautiful possessions. Admires his life. Enjoys the silence for one last moment. Perhaps he goes upstairs to kiss his sleeping children. Even the Devil has affection for his spawn. Coulter looked down at the dregs of his own coffee, bought hours ago at a Dunkin’ Donuts. He saw yesterday’s newspaper, spread out over the passenger-side seat. He thought of his own life with something approaching wonder. He had nothing, but he had far more than the Devil who was about to emerge. Because God was with him, God had blessed him in countless ways. He said an Our Father and Hail Mary, and as he finished a light went on in the garage. He quickly turned the key in the ignition. The starter whirred futilely, and he had an instant of panic. It had to start now! God couldn’t let him down! At last the engine came to life. The garage door slowly rolled up. Inside, he could see the exhaust coming out of the Mercedes’s tailpipe, Beekman’s shape behind the wheel. Another instant of panic: He couldn’t be leaving! Today was Thursday! Then he saw Beekman get out of the car. Of course. He was merely warming it up for the trip into the city. No sense driving in a cold car. A moment later Coulter saw what he had been waiting for: the abortionist rolling a trash barrel down his long driveway to the curb. Beekman stopped at the curb. Coulter could see him better now. He was hatless and wore a gray overcoat with a scarf tucked into the collar. His features were sharp; his hair was thin, with long strands combed over a bald spot. Did he notice the car idling around the corner? He was always suspicious, always on edge. The name Robert Coulter would flit through his thoughts, and he would feel a momentary rush of terror. But he couldn’t see everything. He would be lulled by the familiar ritual. Trash day. Bring the barrels to the curb while the car warms up. Surely there was nothing to fear while doing this? The fear was at the clinic, with the waving signs and the security guards and the death threats. He trudged back to the garage. If he returned, then he hadn’t noticed the car. Coulter put his foot on the brake and slid the car into drive. He slowly lowered the window, felt the cold breeze, the snowflakes hitting his cheek. Without taking his eyes off the garage he reached out and groped beneath the newspaper on the passenger-side seat. His hand closed on the nine-millimeter automatic. He placed it on his lap. Beekman reappeared with another barrel. Coulter knew he should wait until Beekman’s back was turned, until he was walking once more up the driveway, oblivious to the sentence about to be carried out upon him. But he couldn’t. He needed to see. He needed to know that the abortionist knew. When Beekman was halfway down the driveway, Coulter depressed the accelerator and turned the corner. Beekman hesitated, noticing the car, then continued toward the curb. Aim high, Coulter reminded himself. Beekman wasn’t so stupid that he would forget to wear his Kevlar vest. Coulter slowed down, then stopped. Beekman saw the open window, and his eyes widened with understanding and fear, but it was too late. Coulter picked up the gun with his right hand, leaned out the window, and fired. Once, twice, three times. The second one hit, the abortionist’s face exploded and his body crumpled, and Coulter could almost feel the searing wind as his soul plunged down to hell. No time to savor the triumph of God’s justice, however. Human justice had its own rules, despicable though they were. Coulter put the gun back under the newspaper and sped away in the cold, snowy dawn, his spirit aflame but still unsatisfied. For there were many Devils, and his work had just begun. I just gave this fine novel a plug on my blog. Was I correct in telling the world that it’s DRM-free, so they can read it on any device they like? Thank you! Yes, it’s DRM-free.